Our attention to detail extend to the artwork and graphics of all video tribute projects. Q: How is Your Story Here LLC different? A: We are experienced, easy to deal with, specialize in personal and family history projects, and are the best at what we do. Even more important, we care about our subjects and believe all stories should be recorded. Q: How much does a video biography cost? >> article on video biography industry pricing options. Q: Do you only do family history and tributes? A: Much more! Our vast experience with images and video allows us to offer the same exceptional service in photo restoration, general editing and even web video. We specialize in projects with significant interviewing. Q: OK - back to family history: Do you use standard questions? A: No. Each life is different. We work with you to ensure we capture the stories most important to you and your family. Q: Can I give a video biography as a gift? How would that work? Q: What about the photographs? A: We scan and restore each one individually using Photoshop Creative Cloud. We always add captions giving the who, what, where and when. We can also help select photos and usually include relevant archive and historical images. Q: Who will I be dealing with? A: Peter. He owns the business. Q: OK. If I go ahead, how many copies do I get? A: As many as you need. We film, edit and deliver in high definition and also include standard definition DVDs. We can also format the project for smart phones, iPads or any one of a dozen web video hosting sites. Q: I have a lot of genealogy research and old documents. Can you include them? Q: Can you really fit a whole life story into one DVD? A: Not all of it! But only a film recording, like video, can capture the essence of a person - their personality, their smile. How lucky we are to be living at a time when this is possible! Also, we can provide you with all the footage we shoot ("the master tapes") on a hard drive for your family archives. Q: My father had a long life and tells long stories! A: That's great! We typically record two to three times the amount of material actually used. Some clients like to have the unedited "master tapes" in addition to the edited project. Q: How do I get ready? A: Your Story is not a vanity project. It's family history! We certainly encourage you to look your best and can help select an outfit that suits the subject and is video-friendly. Q: I would love you to record my Dad's war experiences. Is that something you have done before? A: This is Your Story. Talk about what is important and comfortable to you. If you say something in the interview that you change your mind about the next day - no problem. We can leave it out. Q: What do you ask about? A: We explore your childhood, parents and grandparents; school days and working life; interests and experiences; lessons learned and values. We find out about ancestors. We like to talk to family members - especially children - to find out areas of special interest to them. How is Your Story Here LLC different to other video production companies? What if I've already written my life story? These are all good questions. Have a look at the Q & A on this page. Or, give us a call on the number below! At Your Story Here Video Biography, you deal directly with a principal of the business. Your Story Here. Let us help you with your greatest gift. The greatest gift. A: Fantastic! That makes the job much easier. And having both a written and a video record of your Mom will be a blessing for generations. 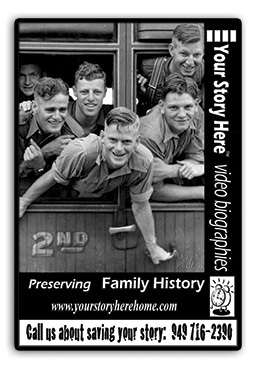 A: If you have photographs, documents, tools or stories then we can help you with a Your Story Here memorial video. Q: So how long does it take and how soon will it be ready? A: The interview and associated filming usually takes around a day - some time to get ready and some time to interview and record. We normally need around two to three weeks to finish the biography - depending on how busy we are. Q: Do you do sports or music highlight reels?